Strategic planning retreats facilitate senior management and executive teams through the rapid development of a clear collective vision, strategy and action plan. They provide the foundation for subsequent work defining performance targets, implementing strategic initiatives and launching project portfolio management. Our facilitator’s experience ensures that your team leaves with deliverables that bring their strategy to life back at the office. 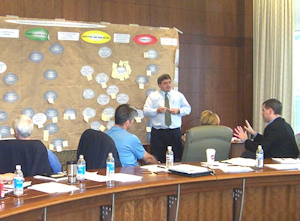 Our standard strategic planning retreat offering can be customized to suit the unique needs, challenges and situations of a variety of organizations in a range of industries. We recommend allowing 2-3 days for a thorough discussion of all new material although the timeline may be readily condensed when updating a previous year’s plan. Module 1 – Trends, Change Pressures & Vision Formulation. Module 1 includes a rapid collective review of environmental factors, competitive threats and internal weaknesses to reveal the principal pressures for change that the organization is facing. The facilitator uses these identified pressures, in the context of the values and mission, to frame the group’s vision discussions. Once vision goals have been established they are tested with major risk scenarios. Module 2 – Strategy Design & Mapping. In Module 2, the facilitator uses the vision goals to guide the group in mapping out the organization’s overall strategy. Strategic objectives, themes and thrusts are laid out to reveal outcomes, expectations, improvements and investments necessary for achieving the vision. Specific marketing, product, organizational development and financial strategies may then be described in more detail after the retreat. Module 3 – Action Planning. In Module 3, the facilitator leads the group in identifying the key strategic initiatives needed to fulfill the strategy and achieve the vision. This challenging work must establish project portfolio priorities, overcome barriers and resistance due to vested interests in non-priorities, and lay out an overall master schedule for the strategic initiative portfolio. Optional Module – Performance Measurements. While many organizations have embraced performance measurement as central to achieving their strategies, many others have not. Our facilitators are able to guide leadership teams in their strategic deliberations whether with explicit achievement targets or more subjective non-specific outcomes. A single page strategy map illustrating key thrusts, objectives and their inter-relationships.